Going out with your baby for a walk or somewhere else, it can be hard to carry your baby around in your arms. And sometimes we feel like providing them with the element of fun which you had during your childhood days. That is why you need to have the wagons for kids. 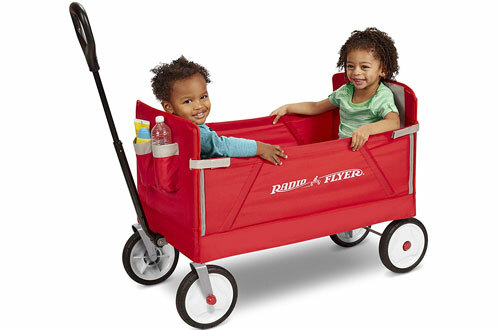 The baby wagons are designed in such a way that they make it very comfortable for you to go outside with your kid. 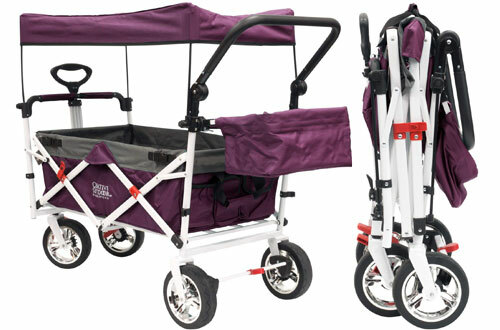 It keeps your baby safe and makes it easy to carry with durable caster wheels. Plus, these wagons come with enough space to keep important items like diapers and napkins for your child. However, for being double sure on your kid’s safety, we have come to conclusion to only the best kid’s wagons in this article. Give it a thorough need to know more. The 3 in 1 EZ foldable wagon for a kid is one of the most versatile folding wagons that you can find for your kid in the market. It can be used in three different ways. 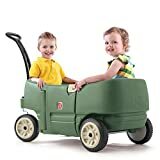 Just an easy pull of the zipper and you can turn the wagon into a bench seat for both you as well as your daughter. Also, it requires no tools or complicated assembly to give your legs some well-deserved relief after a long stroll. Furthermore, it can comfortably seat your two children and can also be used as a storage cart. You can store everything inside for your little adventure with your kids. The seats aren’t ordinary either since they have extra padding that keeps your kids comfier. But the best thing about this wagon is how easily it can be transformed into a compact size. You don’t even need to use both hands to fold it down. This one-handed operation becomes a crucial feature for busy parents. Has a magnetic latch to keep the handle up. Due to foldable design storage becomes a breeze and you can take it anywhere you go. It has quiet ride tires which give your baby a smooth ride. 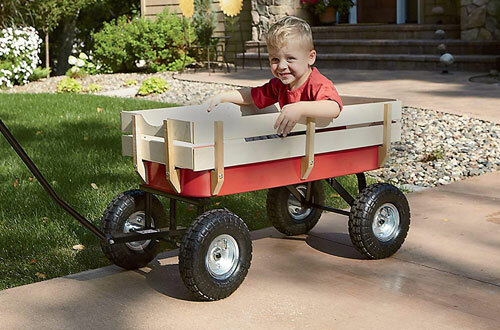 The wagon from Creative Outdoor Distributor can really become a quick hit within your family. It can be used for a leisurely stroll around the market with your kids and pets. Apart from keeping your kids safe, the wagon is generously sized to give you lots of room for carrying essentials and belongings. Unlike competitors, you don’t need to spend extra on the shade. 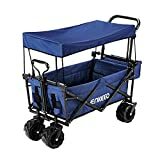 This wagon for kid has a canopy that can easily shield your child from harmful UV rays and can be removed if not needed. The wheels on this thing provide you unmatched manoeuvrability and can swivel in any direction. In fact, the 360-degree design allows you to effortlessly avoid obstacles and go through any terrain. Collapsible design that shrinks it down to a size fit for the trunk of your car. Good and high-quality construction can bear till 150 pounds of weight. The position of the handle can be changed. The amazing step to wagon comes in an attractive willow green colour that looks great for its style. It has two contoured seats on either side that are very comfortable for your children. Safety is also well taken care of with the provided seatbelts. Plus, it even has a hinged gate that allows your children to easily get on or off the wagon. Further, the rubber tread tires enhance the riding experience. Thus, it becomes a smooth as well as noiseless ride. Coming with a long handle, pulling it becomes convenient and so does folding. Undoubtedly, a kid-friendly wagon to look out for. Large caster wheels provide immense stability. Cup holders by the side. 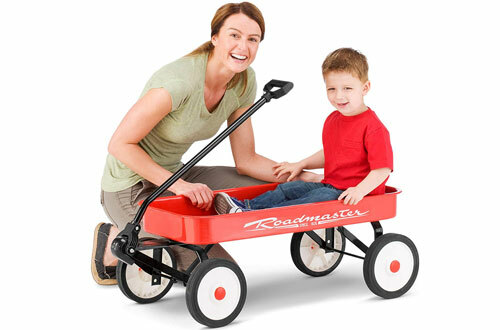 The Pathfinder wagon from Radio Flyer incorporates two wagons in one with an ingenious design. 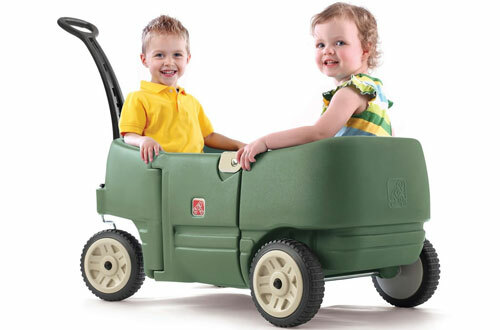 It is extremely durable and can easily seat both of your children inside it for a joyous ride. But that’s obviously not all. 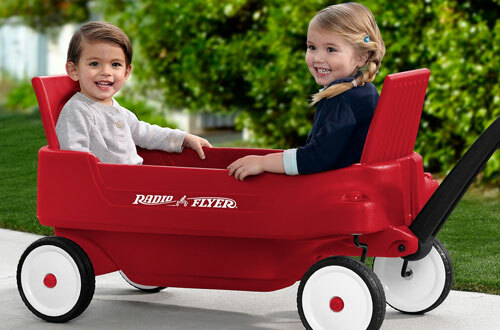 Radio flyer wants you and your kids to have the most convenience while being safe. So both sides have seat belts for your kids and cup holders to store their drinks. Moreover, you can quickly transform the seats to a flatbed and even use this for transporting picnic necessities. It has got Dura-Tred tires that have superior grip and remain stable through most of your journey. The long handle used in the wagon for a toddler for pulling can be flipped under the wagon so that you can store it easily when not in use. Tires are nice and big at 8.5-inches. A total of 4 cup holders for your children. Suitable for kids who are older than 36 months. The Classic Berlin flyer red wagon always brings you and your kids back to the good old days when cell phones didn’t interfere with family time. 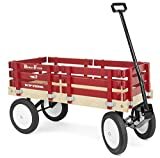 The base of the wagon is reinforced with hardwood planks and steel frame for greater longevity. You can even easily customise the wagon according to your needs with the removable side rails. Made of hardwood, they can be removed to create a small opening for a leisurely ride. Steering with the long handle is even easier and has the no-tip feature which keeps the wagon under your full control. Besides being light in weight, it has non-tip steering as well as a no-pinch handle. The handle can be removed by releasing the pin. Has a non-toxic paint that will last for a prolonged period of time. 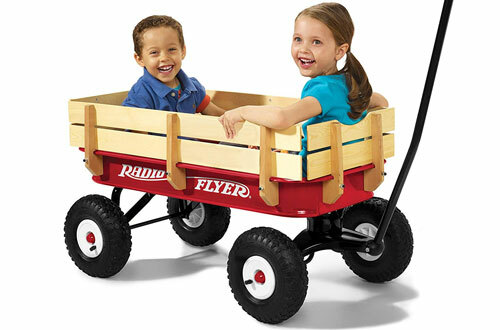 Another fabulous wagon from Radio Flyer that would be an instant hit with your kids. This wagon is equipped with 10-inch tires that are heavily reinforced to go through soft or rugged terrain. 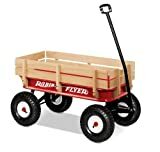 Being one of the premium models from Radio Flyer, it has the reliability and safety that other manufacturers fail to deliver. 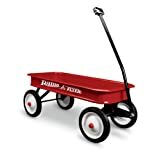 The bright red wagon features an extra large body with sturdy side panels that are crafted from solid natural wood. Your kids would love the tires too since they are real air tyres made of rubber. So a nice and smooth ride is always achieved. You also get an extra long handle that makes pulling the wagon a stress free task. After you are done with you joy ride, the handle conveniently falls under the wagon for easy storage. Turn radius control is smooth and efficient. Weight capacity of 200 pounds. 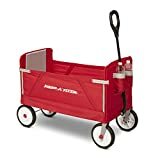 As soon as someone says classic red wagon for a kid, everyone is sent to the good old nostalgic days. 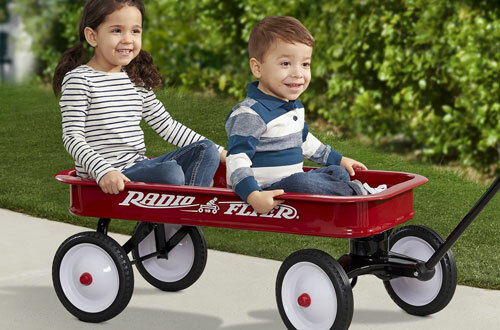 The classic red wagon from Radio Flyer has given years of fun to generations of parents and children throughout America. Now you can relive those fond memories with your child. The wagon provides fun and entertainment for any kids who are 18 months or older. It has a seamless all steel construction with ingenious engineering that equips this wagon with added durability. Further, it is extremely safe for your child since it doesn’t have any sharp edges. With the big and rugged tyres, it can withstand loads of fun throughout the growing years of your children. The handle is super long and foldable so that you can store this in your car trunk and take it anywhere in the back of your trunk. Features turning radius that can be controlled to avoid tipping. 10-inch wheels constructed of steel with rubber tyres. 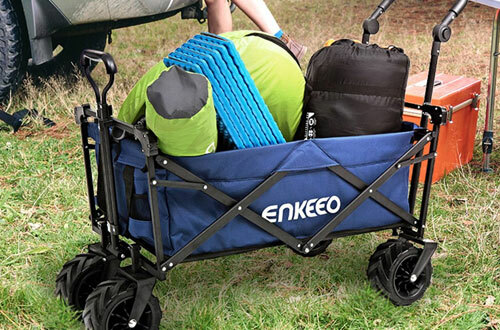 Outdoor activities with your kids become a lot more fun and relaxing with the foldable wagon from ENKEEO. It is phenomenally adaptable and can be used for several situations. Other than being a fun ride for your kids, it can even be used for shopping, at the barbeque party or even camping. Your kids are also safe and secure from elements of nature in this wagon. It comes with a detachable canopy which protects your children from harsh sun rays and rain. Moreover, you even get a pocket at the front for storing your smartphone, earphones, accessories and more. When you don’t need it simply detach it from the front and get rid of the extra bulk. The handle has good engineering with its tilting function. You can quickly push or pull the wagon with the handle and tilt it to your preference. Along with its collapsible design, it can be set up or shrink back within seconds. This does not only make it portable but also saves your precious time. Strong tires that are 3.7-inches thick and have a diameter of 7-inches. Tires can move full 360-degrees. At 28.6 pounds it is lighter than most other wagons. Be it dirt, road, grass or a bit uneven terrain, this little red wagon from Kotulas conquers over all. It has big chunky tires with enough grip and ruggedness to keep your wagon stable in all terrains. The wooden boundary over the wagon increases its height considerably and makes it much safer for your kids. 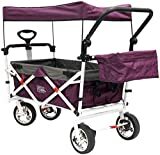 In fact, it has a massive 220-pound load capacity which means that you have plenty of room to carry several things in the wagon. Comes with a long handle, the experience will be one of a kind. The wooden sides can be removed when not needed. The steel tray is 4-inch deep. Some things become eternal and irreplaceable parts of your life. PB and J sandwich, grilled cheese, popcorn and the Roadmaster steel wagon. 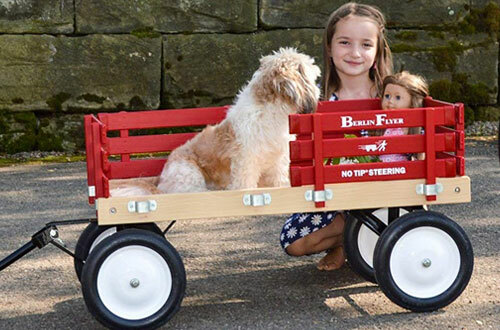 You can give your children the same joy that you felt while riding a red wagon in your childhood. The whole thing is constructed of steel which gives it a very strong structure and last few for a very long time. It has rounded edges so that your child remains safe. Furthermore, the wagon is coated with a special powder that protects it from corrosion and helps maintain that Shiny new look for a very long time. Best for kids of 2 to 5 years of age. 8-inch wheels with terrain-friendly rubber tyres. Long handle for efficient reach. Keeping your kids safe is your first priority. And these wagons are designed to give an enriched yet safe experience.